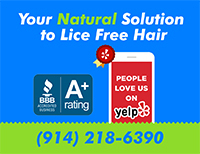 At Lice Free Noggins, a professional mobile in home head lice removal treatment service in Westchester, NY, all of our highly trained Lice Treatment Specialists are experts when it comes to head lice treatment and nit removal. Our highly trained staff will not only end the cycle of head lice but also provide you with the education and hands on training needed to prevent future outbreaks. What makes Lice Free Noggins the preferred lice treatment service in Westchester? Westchester, NY’s #1 Professional Head Lice Removal Specialists! A certified clearance certificate that can be taken back to your child’s school, camp or daycare explaining the services that Lice Free Noggins has performed. This certificate is our assurance that our work and your dedication to follow up is reason to be confident that the lice infestation has been resolved and is recognized by many schools and child care agencies. Getting rid of head lice does not have to be a stressful experience. We offer best lice treatments for adults and kids. Chemical-free, safe, effective, and fully guaranteed lice treatment service. We have successfully treated thousands of families in Westchester and we can help yours today! In-Home Lice Removal Treatment Service In Westchester, NY. We've treated over a thousand families in Westchester. We focus on providing the highest quality service by following a standardized lice removal system. Our lice services are quick, pain free, competitively priced and NO Travel Fees! Getting a call from school to pick up your kid because she has lice is very frustrating. As soon as i heard my own head started to itch. We knew someone who dealt with lice before and they recommended lice free noggins. I never realized i can get this service in my own house! I would hate to be sitting in a "lice salon". She was back in school next day. I never thought i would be leaving a review for a lice removal company, but we just had such a great experience that others need to know. Don't waste time trying to do this yourself, I tried but they always seem to be coming back because I would miss one and it all it takes. Leave it to the professionals,.. it was worth paying and getting rid of all the lice and nits. We tried Rid and i wish we did not. It didn't work and i ended up putting chemicals into my kids scalp... what was i thinking?? A friend whose child was also sent home from school with lice recommended Lice Free Noggins, we scheduled an appointment and someone was over shortly. My daughter is usually whiny but did not complain at all during the process. Thank You! Had a great experience with lice free noggins. We called a few places but were turned off by their hourly rates,... lice free noggins had a flat fee for lice removal. We were able to get same day appointment and it went very smooth. Professional in-home head lice removal and head lice treatment service in Westchester, NY. We offer a safe and effective head lice removal treatment for your entire family. Our lice treatment products are natural and non-toxic. We guarantee to eliminate your family's head lice & nits in just one visit. Flat rate pricing and NO travel fees!